A simple, easy-to-use devotional that helps you teach the Westminster Shorter Catechism to your family. One week is devoted to each catechism question, with key Scripture passages and short readings that explain the main points of each question in simple language. 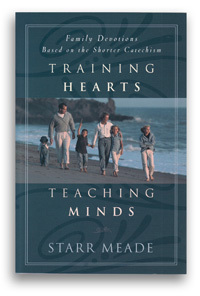 This practical guide can be easily incorporated into family worship or mealtimes; we use it as part of our school time. If you are unfamiliar with the practice of teaching with the historic catechisms, this book is an excellent place to start. I am so thankful to have found this book. As an adult, we often take it for granted that our children have been exposed to or even know basic Christian principles. They may hear stories at Sunday school or youth group, but may not understand what they believe and why. This book speaks about passing the baton of faith on to our children and how we must be intentional about it. The great thing is that the book has a reading for Monday thru Saturday and they are really short and accompanied by one or more Scriptures that correspond to one catechism. So you repeat the same catechism for the whole week and Ms. Meade covers several aspects of it. Even my 5 year old is able to sit through the devotion. I have found it an extremely valuable resource for not just my children, but for me. It helps me to be able to feel comfortable answering questions about faith, God, the Bible, etc., and not be caught off guard or flat-footed without an answer. Ms. Meade discusses that this information must be taught to our children as soon as possible because they are being confronted with major decisions at early ages and they must have a strong Biblical foundation. Seems obvious, but many parents either think someone else will teach the children or they will learn it on their own. Wrong on both accounts! Just check out the book. You won't be disappointed! A Must For Every Family!! Our family has been using this book for our family worship for over a year now. It is amazing what children can learn at such a young age. Every family should have this book and be using it in their home. I have even learned so much from the lessons myself. Not to mention the theology is so sound. It has impacted our family!!! My husband and I have been using this book with our children for our evening devotions. It's been such a help to us in teaching doctrine on a level that our children can understand. It's opened up a number of conversations on the practical side of how to apply scripture in the day to day.